We love getting our Family Fun magazine in the mail. It always comes loaded with fun crafts and snacks to make. My eldest daughter and I like to read it together and I let her pick out which craft she wanted to try and make. She picked the homemade sprinkler, which looked like a lot of fun. Homemade sprinkler out of a 2-liter bottle - how fun! We also got some extra hose washers (above) to help seal up the leaks. So the first thing you want to do is to rinse the empty 2-liter bottle and take off the label. Put one of the red washers inside one side of the adapter (the side that is going to fit over the bottle) and twist it on and secure tightly to the 2-liter bottle. By the way, the swivel adapter does come with a black washer already in it, we added the second red one as suggested in the magazine directions. Now the holes are a bit bigger. My guess is if you just did push pins sized holes, it might be more of a mister/sprayer effect (great for gardens) but we only had one 2-liter bottle to work with so I will experiment with different sized holes the next time I have a chance. With the slightly larger bamboo-enhanced hole size, we are now ready to test our experiment. It only took as a few minutes to put this whole thing together (well, minus time it took to drive to Home Depot). We then took it outside and excitedly attached it to our garden hose. We started with the water pressure on low and watched the 2-liter bottle fill up and then the water suddenly squirted out of the top. Hooray it works! Rock on. That works pretty great! As a bonus, the girls liked how the water in the bottle acted like a "magnifying glass" on the grass below. Shortly after they they were clamoring to get on their suits and try it out for themselves. This by the way turned out to have more than one use. Because you can choose the strength of the spray (water pressure), the size of the holes (small for mist, larger for kid sprinkler), and angle the direction of the spray (straight up, to the side), the sprinkler also made a nice way to water our garden lightly. We also have used it this year to help wet down our slip and slide, when the store-bought slide sprayed the wrong way. 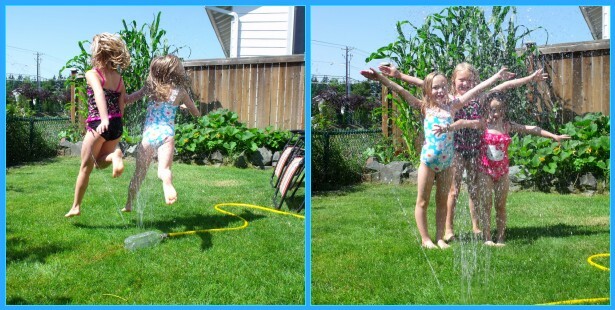 My girls were so very proud of themselves for making their own sprinkler and want to make more this year so they can run through more than one at a time, obstacle course style. Let me know if you end up making this and what you use it for! This will really help us. We're gonna do this for a science project and thank you so much for the information. This craft for making easily homemade sprinkler is amazing to indulge with kids during summer. Thanks for this interesting write-up. This a great idea. I'm tired of fighting with the sprinkler. How can we prevent the hose from moving around, all crazy from the water pressure? When you attach the hose to the 2 liter bottle, it fills with water before it starts to spray, so the heaviness of the 2 liters of water in the bottle kept ours on the ground. We also attached it first, then turned on the water pressure. I hope that helps. hands down . . . The BEST! !